Last week a friend and I went to dinner at an Italian place. My friend ordered a dish in a wine sauce and she let me have a taste. I decided right then that I needed to come up with a recipe that had a wine sauce. This is what I came up with using ingredients that I already had at home. Put the chicken stock, wine, minced garlic, and 1 1/2 tsp sea salt in a small saucepan. Bring to a boil. Continue boiling, stirring occasionally, until the sauce is reduced by about half. While the sauce is reducing, heat the olive oil in a large skillet. Add onions and saute until they are translucent. Add the mushrooms and chicken. Cook, stirring, until the chicken is no longer pink. Put the broccoli in the skillet. It will steam beautifully just sitting on top of everything else. Season with salt and pepper to taste. Check sauce and adjust seasonings if necessary. Pour the sauce over the mixture in the skillet. Sprinkle with fresh thyme and toasted sesame seeds. Stir to distribute sauce and seasonings. Serve with a green salad and garlic toast. 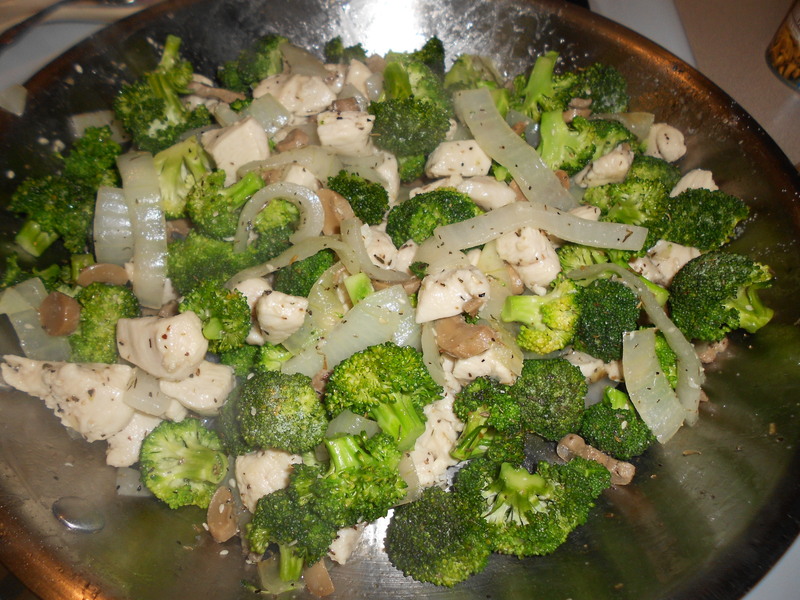 This was a really quick and easy meal and it made the house smell really good. The kids liked it so much that they ate it all and didn’t leave me any leftovers for today! 🙁 You could serve it over pasta or rice for a more filling meal, or if you want to stretch it. This will easily served four adults, or in my case, 1 adult and two teenagers. I just love it when an experiment works out! Do you experiment in the kitchen? What has been your favorite experiment so far?